Now that the official press release is out, I can finally tell you a little about what 's going on with Finding Bigfoot. On October 30, a special two-hour episode will air, and I strongly suspect you will love it. We visit Bluff Creek, CA and delve into the history of bigfoot in America. While I cannot spoil any secrets about what we do nor who we speak to, I can absolutely promise you that any bigfooter will want to see this episode. I know that filming it was nothing less than historic for several reasons, and I'm sure much of the great stuff will make the editing cut. the road filming season 2 when it airs, so I'm not sure i'll see it right away...), as well as a video debrief with Craig Flipy when I return to Portland. Additionally, the cast of Finding Bigfoot will partake in a panel discussion at the New York Comicon convention on October 14th. More on this, as well as the two-hour special as the dates grow closer. This fall, the Bigfoot Field Research Organization (BFRO) team from Animal Planet's FINDING BIGFOOT trudges deep into California's Redwood forest to investigate one of the most infamous and disputed pieces of Bigfoot evidence ever - the Patterson-Gimlin footage. Premiering Sunday, October 30, at 9 PM (ET/PT), the two-hour special FINDING BIGFOOT: BIRTH OF A LEGEND takes viewers to the site where the notorious footage was captured to investigate the elusive beast's existence and settle the more than 50-year-old debate originated by the tape. Outfitted with the latest technology, including night-vision and infrared cameras, the BFRO team also scours the Redwoods to uncover additional evidence of the presence of Sasquatch. With more Bigfoot signals discovered in the Redwoods than anywhere else in North America, each broken branch or peculiar noise could mean a Squatch is lurking nearby. Prior to the debut of the special, the BFRO team will make an appearance at this year's New York Comic Con convention. On Friday, October 14, at 6:30 PM, the entire cast -- Bobo, Cliff, Matt and Ranae - will debunk Bigfoot myths with a special sneak preview of theBIRTH OF A LEGEND special. Following the sneak peek, the team will discuss its Squatchin' experiences from the show and share years of Bigfoot knowledge and research on a panel. In FINDING BIGFOOT, a four-person team from the BFRO -- a leading scientific research organization exploring the Bigfoot/Sasquatch mystery -- investigates Sasquatch sightings by interviewing locals, examining evidence and infiltrating the woodlands and forests in places where Bigfoot has been reported. FINDING BIGFOOT is produced for Animal Planet by Ping Pong Productions. Keith Hoffman is the executive producer for Animal Planet. Brad Kuhlman and Casey Brumels are the executive producers for Ping Pong Productions. 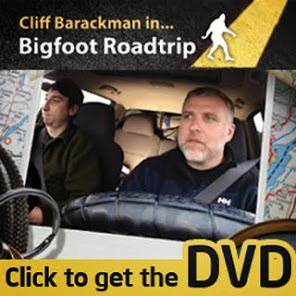 Cliff, you win my award for Best Bigfoot Field Researcher, despite being a TV star. Can hardly wait! Linda Newton-Perry of Bigfoot Ballyhoo.